Press ON / OFF icon. The machine moves automatically to beverage preparation position. Close machine manually. Thanks to the intuitive interface, you can select Cold water (icon), XL volume function, Hot water (icon) and touch volume selector. Thanks to the energy save function the machine is automatically turned off after 5 mins of non use in order to reduce to consumption. 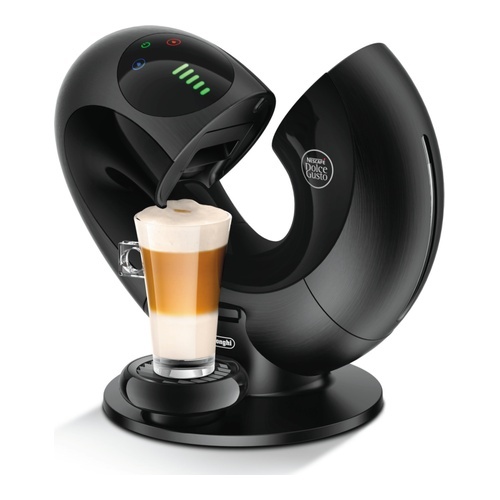 The Dolce Gusto Eclipe coffee machine moves automatically to beverage preparation position. Close machine manually. It has several different settings that you can control on the touch screen and it has a removable water tank (1 L.) with water level indication window.